Nightmare in the north-east Atlantic! Last year witnessed an alarming escalation in whaling activity in the north-east Atlantic. This whaling is taking place in waters on Europe’s doorstep, in Britain’s back-yard. Over 2,000 whales were killed by the whalers of Iceland, Norway and the Faroe Islands last year, making the north-east Atlantic now the epicentre of global whaling. Although whaling is strongly opposed by the public and whales are strictly protected in British and all EU waters, there seems to be no political will to oppose the defiant whaling nations that are killing more whales every year. 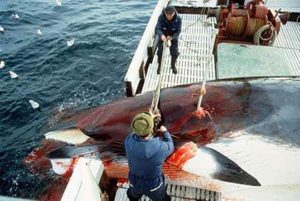 According to Norwegian news reports, by the end of June, with months of the whaling season left, over 600 minke whales had been cruelly harpooned. The consumption of whale meat is being heavily promoted in the country after years of decline in consumption. Iceland’s whalers are targeting 154 fin whales and 229 minke whales this year. Already this year, Iceland’s whaling company has exported a shocking 2,000 tons of whale products to Japan. More than 5,000 tonnes of whale meat and blubber have been exported to Japan since Iceland’s resumption of commercial whaling in 2006, much of it used in luxury dog food! In 2013, a staggering 1,100 pilot whales and 430 white-sided dolphins were hacked to death in the Faroe Islands which are situated midway between Scotland and Iceland. The killing goes on despite repeated public health warnings that the meat and blubber is so contaminated with mercury and other toxic pollutants that it is unsafe to eat. Despite the huge kills in recent years, another whale hunt took place in May this year and another 13 pilot whales were killed. Hundreds more whales and dolphins could be killed this year. Around 200 large whales are killed in Greenland each year. While authorised by the International Whaling Commission (IWC) as a subsistence hunt, this whaling has become increasingly controversial in terms of its commercialisation and actual need for the meat and blubber. Meanwhile, very large numbers of small whales and dolphins are also hunted in Greenland. Norway resumed commercial whaling in 1993 having ‘objected’ to the ban on commercial whaling introduced in 1986. The Norwegian Government has set a record quota for a staggering 1,286 minke whalesthis year. Last year 566 minke whales were slaughtered. Iceland resumed commercial whaling in 2006 (but killed many whales for so-called ‘research’ before leaving the IWC in protest at the whaling ban in 1991). Last year an annual quota of 216 minke and 184 endangered fin whales was set. In 2013, 38 minke and 134 fin whales were actually killed. In the Faroe Islands no quotas are set which means up to a thousand or more whales and dolphins are hunted each year, producing huge volumes of meat and blubber so contaminated with toxic pollutants that health leaders have long warned it should not be eaten. The campaign to ‘save the whales’ began in the mid-1970’s and culminated with the historic decision taken by the International Whaling Commission (IWC) to introduce an indefinite ban on commercial whaling in 1986. While this ban saved many whale populations and even entire species from extinction, it has been persistently defied by just a handful of nations. Encouraged by little opposition, those nations are now escalating their whaling operations to unprecedented levels. The renegade whaling nations have killed around 40,000 great whales during the 28-years of the commercial whaling ban and this year will see whales killed in record numbers. While Australia has taken Japan to the International Court of Justice in the Hague to challenge its so-called ‘scientific’ whaling programme in Antarctica, whaling in the north-Atlantic is escalating unopposed. •In Norway, a marked decline in interest in whaling and eating whale meat has led to a concerted marketing drive to try and rekindle the public appetite for whale meat. •In Iceland, most of the minke whale meat is actually eaten by foreign tourists! This has led to the UK foreign Office issuing warnings to UK citizens not to be tempted to try it when visiting the country. 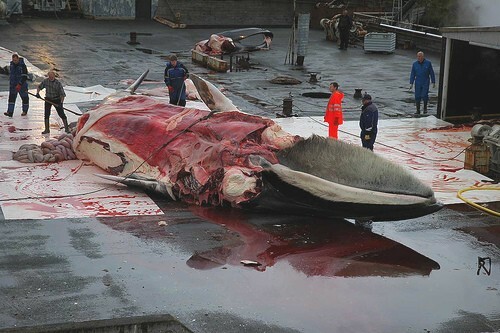 •Meat from the endangered fin whales has been intercepted at EU ports in Holland and Germany and returned to Iceland. It has even passed through the port of Southampton! •In Japan, the imported meat of endangered fin whales from Iceland is being used in dog food! •In the Faroes, Chief Medical Officers have repeatedly warned people to stop eating whale meat because of the toxic pollutants that concentrate in the whales, or face serious health problems for themselves and their children. Campaign Whale is launching a major campaign targeting whaling in the north-east Atlantic. Further news of the campaign and how you can help will follow soon.